With Apple’s huge growth in the computer, smartphone and tablet markets, one area the company is seeing massive adoption is in enterprise sector, with more and more company IT departments issuing staff with Macs, iPads and iPhones. 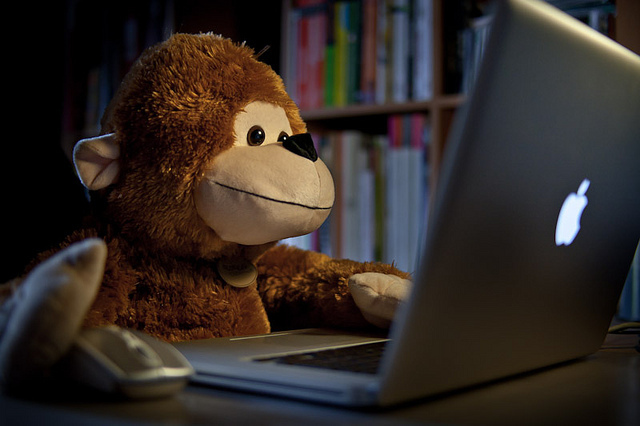 Forrester Research surveyed more than 10,000 information works and IT decision-makers in North America, issuing a new report which suggests that one in five information workers now uses an Apple product for work. 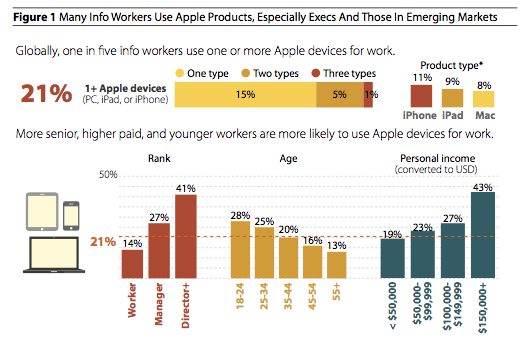 Polling results from 17 developed and emerging markets, 21% of workers admitted to using an Apple product (including personal devices), with use of Apple’s product types evenly spread. 11% said they use an iPhone, 9% using an iPad, and 8% using Macs, while 6% said they used one or more Apple devices. The use of Apple’s Mac computers has grown steadily but it has seen rapid growth in the enterprise. Forrester reports that 46% of enterprises (companies with more than 1,000 employees) have reported issuing their staff with Macs, an increase of more than half in two years. Of these same companies, 27% said that they now support the iPad, and an additional 31% have plans to support Apple’s tablet device in the future. When it comes to the iPhone, 37% of “mobile decision-makers” reported that they supported the iPhone in 2011, which is expected to rise to 55% in 2012. Forrester believes that Apple’s enterprise share will continue to expand, helped by the lack of competition across all three device categories (PC, Tablet, Smartphones). Google’s Android platform is selling very well with consumers for smartphones, but the wide variety of devices, features, and software support, plus inconsistency of support for OS upgrades, is fragmenting the Android ecosystem. Meanwhile, Google has yet to dent the iPad’s dominant tablet position, while Amazon’s popular new Android-based Kindle Fire tablet bypasses Google’s app store, Android Market, altogether. In PCs, Google’s Chromebook initiative to replace Windows PCs will take years to gain traction. By comparison, Apple has solid offerings in all three categories, keeps a limited but still highly desired range of models, and creates great consistency and upgradeability across the devices, characteristics that are very attractive to enterprise buyers. Forrester hears from CIOs that they feel protected by Apple’s brand and app store strategy in a way that they don’t with Android products. The research firm believes that Apple leads the way in demonstrating how “consumerization leads to enterprise adoption,” as its devices are suited for both personal and work use. With Apple supporting enterprise IT systems including Exhange, workers are able to blend business and personal lives, something that Android is not quite able to do, and with Windows Phone lacking in general adoption.